I've been trying new baking recipes in an attempt to make healthier, less processed foods for the kiddos. My latest attempt was with pizza dough. It was actually pretty easy and the kids gobbled it up! It helped that the kids got to top their own pizzas, which is why Bernardo's (on the left) only has sauce and pepperoni. This made two 10-12" thin crust pizzas. Total time of 1.5-2.5 hours, depending on how the dough rises. Add yeast to warm water. Stir and let sit for 4-5 minutes or until dissolved. In the mixer (I used my standing Kitchenaid), combine salt, sugar, oil, and 3 cups of flour. Add the yeast/water mixture. Mix for 7-10 minutes on low speed. If the dough is sticky/too wet, slowly add additional flower. The dough should be smooth. Lightly coat a bowl with oil or butter. Place the dough in the bowl, cover and let rise 1-2 hours (or until doubled). Preheat oven to 475 degrees F for 30 minutes. Divide the dough into two balls and cover with plastic wrap. Let sit for 10 minutes. Prepare two baking sheets: grease and dust with flour or corn meal. Roll out dough on silicone mat or floured surface. Pinch up the edges to form a rim around the dough (optional). Lightly brush with oil and let sit for about 10 minutes. This helps the dough not get soggy from the toppings. Make dents into the dough with fingertips. You want to dent, but not rip the dough. This helps prevent the dough form bubbling up during baking. Top and bake for 10-15 minutes. Don't go too heavy on the sauce! 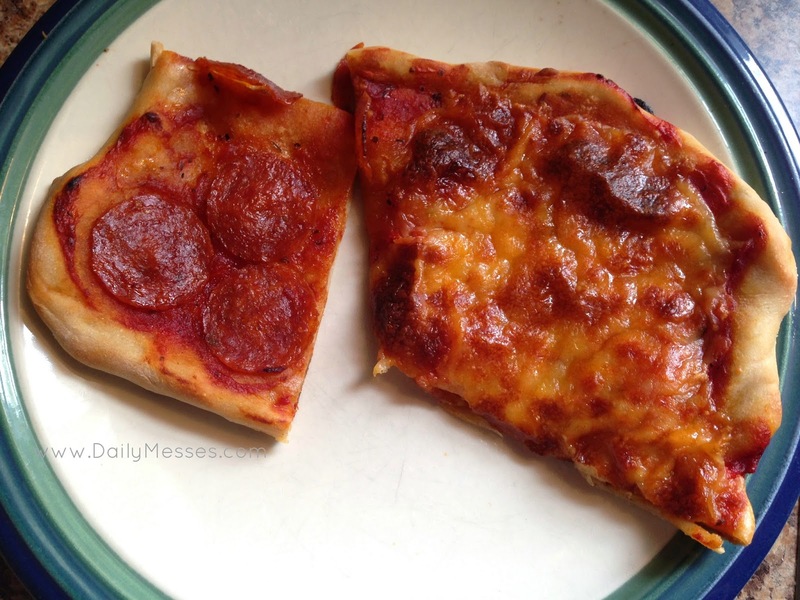 DM Tip: We made a thin crust pizza, which turned out nicely. If you want a thicker crust, you may want to pre-bake the crust for maybe 5 minutes before topping.